Western blot analysis of extracts from various cell lines using MMP-1 (E9S9N) Rabbit mAb (upper) and β-Actin (D6A8) Rabbit mAb #8457 (lower). Immunoprecipitation of MMP-1 protein from SCaBER cell extracts. Lane 1 is 10% input, lane 2 is Rabbit (DA1E) mAb IgG XP® Isotype Control #3900, and lane 3 is MMP-1 (E9S9N) Rabbit mAb. 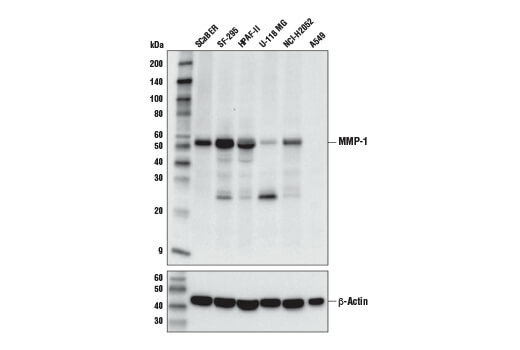 Western blot analysis was performed using MMP-1 (E9S9N) Rabbit mAb. 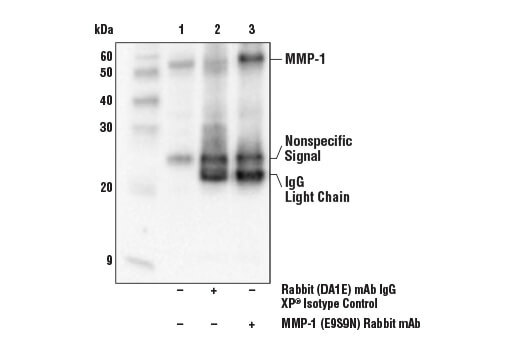 Anti-rabbit IgG (light chain specific), HRP-linked Antibody was used as secondary antibody. MMP-1 (E9S9N) Rabbit mAb recognizes endogenous levels of total MMP-1 protein. Monoclonal antibody is produced by immunizing animals with a synthetic peptide corresponding to residues surrounding Val267 of human MMP-1 protein. The matrix metalloproteinase (MMP) family of proteases is a group of zinc-dependent enzymes that target extracellular proteins, including growth factors, cell surface receptors, adhesion molecules, matrix structural proteins, and other proteases (1, 2). Within this family, MMP1, MMP8, and MMP13 have been characterized as a collagenase sub-family of MMPs targeting fibrillar collagen (collagen type I, II, and III) for degradation. In addition to collagen, MMP1 also has activity toward a broad array of other ECM proteins such as fibronectin, gelatin, aggrecan (etc. ), as well as growth factors, chemokines, and cytokines (3). MMP1 is widely involved in tissue remodeling during wound healing, tumor growth, invasion and metastasis, and arthritis (4-6). Löffek, S. et al. (2011) Eur Respir J 38, 191-208. Nagase, H. et al. (2006) Cardiovasc Res 69, 562-73. Foley, C.J. and Kuliopulos, A. (2014) J Cell Physiol 229, 1875-80. Ala-aho, R. and Kähäri, V.M. Biochimie 87, 273-86. Rohani, M.G. and Parks, W.C. Matrix Biol 44-46, 113-21. Burrage, P.S. et al. (2006) Front Biosci 11, 529-43.